It's hard to come up with "crafty" things to make for guys. After racking my brain for a few days I decided to whip him up a CD holder for his car. He already has one on his visor, so this one is for his glove box (he loves music! A LOT). This project is pretty easy. First, cut rectangles of fabric starting with 12" x 12.5", then 11" x 12.5", then 10" x 12.5"...etc...until you get down to 6" x 12.5". 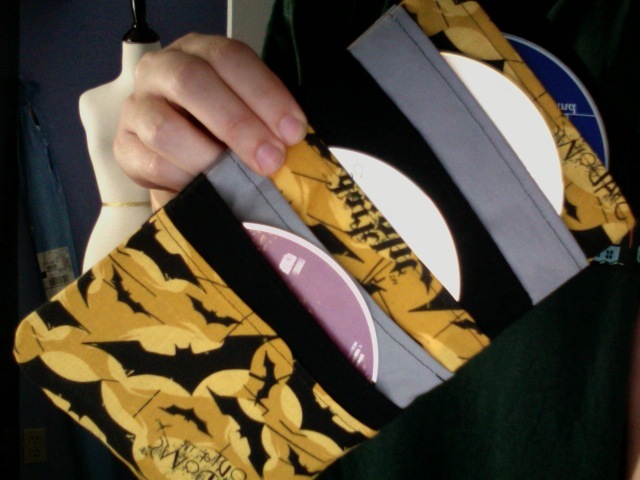 I later decided to add one more pocket at the bottom measuring 5" x 12.5" because I wanted the Batman fabric to be at the bottom. Next, line up the two largest pieces at the bottom (the raw edge). Measure 4" down from the top of the shorter of these two and sew a line across. Then place the next shortest piece on top, measure 4" down and do the same thing. Keep doing this for every piece (except the last one since it will just get sewn into the bottom.) You can see in my picture where I sewed the gray fabric 4" from the top. Once you flip it right-side out, top stitch across the top to close the gap you left. And you're done! This CD holder will hold 14 CDs (7 on each side). If you don't add the extra shorter pocket to the bottom it will hold 12.